Advertise - If you would like to expose your site or brand to thousands of readers and potential customers by advertising here, please contact me for more information on rates and opportunities. Space is available for non-affiliate banners in various sizes. For a media kit, rate card, or more information, please e-mail info[at]thekeytochic[dot]com. Collaborate - To partner with me for social media campaigns, sponsored digital content, blog consulting and strategies, fashion event coverage, guest blogging and writing assignments, blog and graphic design, brand ambassadorships, image consulting/styling, trend spotting, or personal shopping in the Los Angeles area, please e-mail info[at]thekeytochic[dot]com. References and work history are available upon request. Please note that I do not accept guest content. 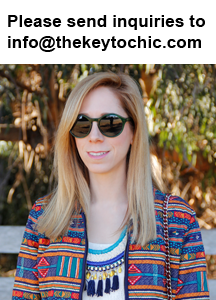 Promote your brand - If you have a sample that you think would be a great match for this blog, and you'd like to see it featured on The Key To Chic, please send a lookbook or pitch to info[at]thekeytochic[dot]com. Please review my pitch policy below before sending e-mail. Please note that featured samples will not be returned. Pitch policy - Please read my tips on how to pitch to fashion bloggers as seen on my other blog Fashion Trend Guide. Please only send pitches that are relevant to The Key To Chic. Topics covered on this blog include: women's fashion, accessories, designer collaborations, capsule collections, trend reports, fashion trend forecasting, and Los Angeles fashion/shopping events. Topics are written from a personal point of view, so if I have not experienced an event or product in person, I am highly unlikely to cover it on the blog. Please do not send pitches about maternity style, childrenswear, book reviews, plastic surgery, jewelry giveaways, movie releases, or skin care. Please note that The Key To Chic does not participate in: dedicated e-mails, giveaways, or ads in exchange for gift cards or products. Please click here to see The Key To Chic's print and online features over the past few years. To request a media kit, please e-mail Melissa at info[at]thekeytochic[dot]com.